Project-based learning can be messy, but planning to have student inquiry lead your instruction can make it an orderly mess. Planning for project-based learning takes a lot of time and effort. All teachers who have planned a new project know the work that goes into making one a success. You have to create an engaging driving question to focus the inquiry. You need to select and plan for products and authentic audiences while being mindful of voice and choice. You have to plan a great project launch. You must align the project to standards. And the list goes on and on. However, after this initial phase, the planning isn’t complete. Next you move into the nitty-gritty—the day-to-day work of students, the calendar of tasks and instructional activities. Because the students drive the learning, this aspect of planning can be difficult to map out. Here are some ideas on planning PBL project implementation so you can be both ready to go at the outset and flexible in responding to how students shape the project as they learn. Start with the learning targets: While planning a project, it’s easy to move quickly to the activities, tasks, and instruction you think students will need. Most of the time, our instincts are spot on, but sometimes we get too focused on these points and lose sight of what we want students to learn. When we focus on that, we can be more intentional about the instruction students will need. While they’re nothing new, learning targets can help provide a focus for learning and the intentionality needed for implementation. We should start by unpacking standards into small, achievable, focused learning goals. This involves taking a standard and analyzing the nouns and verbs to create leveled targets. For example, a standard might include the phrasing “analyze the causes and effects of a historical event or development,” but it might be helpful to create targets that include words like “identify” or “classify” in order to ensure that learning is incremental and moves at an appropriate pace. The learning targets we generate might separate out concepts if a standard has several within it. For example, if the standard included the concepts “perpendicular,” “parallel,” “intersection,” and the like, I might have a different learning target for each one. Many teachers use “I can” learning targets to make them more student-friendly. When we break down our objectives, we make learning more incremental, and we, as teachers, can think through all the learning that needs to occur and how long that might take. Plan the what and how, not the when: Many of us are linear people—we like to have events occur in a logical, often chronological, order. But when we plan a PBL project, we need to be more flexible in our thinking. Yes, some things will need to occur in a linear fashion. For example, we most likely will have a clear start, aim for many set milestones, and come to a logical conclusion with a demonstration and celebration of learning in the project. That broad linear outline allows for a lot of flexibility. Once you have your learning targets in writing, you can pair them with appropriate instruction, scaffolding, and tasks that will support students in meeting them. Activities and instruction don’t disappear in a project—they just need to be used at the right time. PBL focuses on inquiry and student questioning: Once students generate their initial list of questions, teachers can be ready with appropriate instructional moves to support their learning. Instead of having a rigid calendar, you can keep a list of scaffolding and instruction that’s ready to go when students are ready for it. They will continue to answer questions, ask new questions, and discover information and ideas, and you’ll eventually need to provide that scaffolding and instruction. The Buck Institute for Education has a Student Learning Guide form to help you plan that process. 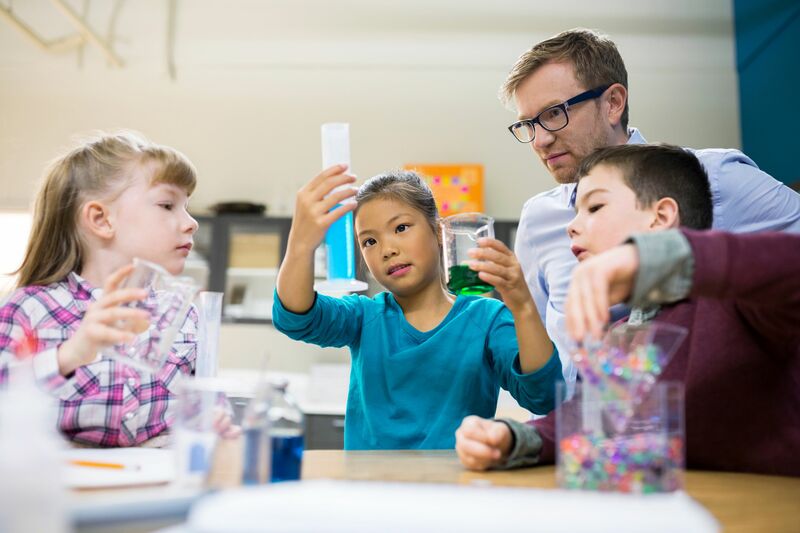 Leverage differentiation: One of the key components of differentiating a PBL project is thinking about what instruction and scaffolding is needed for the whole class, for small groups, and for individuals. We can learn critical lessons on differentiation from the pedagogy for English language learners, special education students, and so on. We can provide different types of instruction and scaffolding instead of using a one-size-fits-all approach—planning units of instruction while knowing that all students may not need every unit. We have those units ready, but only provide them to the students who need them. Through assessment, we can identify when the instruction and scaffolding are needed—with the peace of mind of knowing that we’ve thought through the instruction and are prepared to differentiate as needed. Be prepared, mentally and on paper, for an orderly mess in a PBL experience. When we plan projects focused on the learning, we can be more responsive to students, with lessons and assessments on hand to provide just-in-time instruction for them as they learn through powerful inquiry.